PrimeImaging features ten of the top radiologists in the Chattanooga and North Georgia area. Like other medical specialists, radiologists complete four years of medical school, followed by at least four years in a residency program. Eight of our physicians went even further and worked in an additional fellowship program. All are board-certified. 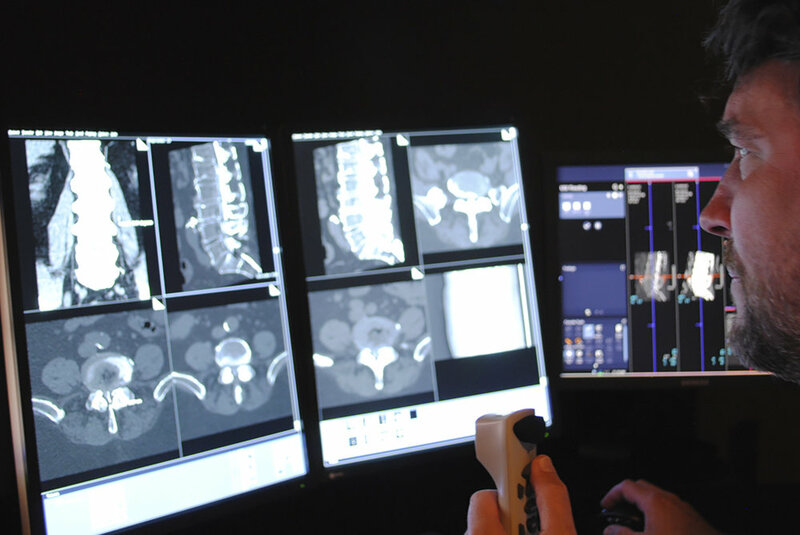 Our radiologists have 10+ years of experience in at least one of these fields: vascular and interventional radiology, musculoskeletal imaging, nuclear medicine, positron emission tomography, diagnostic radiology and neuroradiology. Although each has their subspecialty, one clear goal connects our doctors: To precisely diagnose and combat diseases and injuries using our state-of-the-art medical imaging technologies. Dr. Allen, a Tennessee native, joined PrimeImaging as one of its musculoskeletal experts after completing a musculoskeletal and emergency radiology fellowship at Vanderbilt University where he also was faculty and clinical instructor in the radiology program. The list of educational institutions he attended includes Tennessee State University (undergraduate), Meharry Medical College (medical doctorate), Harvard Cambridge Hospital (internship) and Tulane University Hospital (residency in diagnostic radiology). While completing his Doctor of Medicine degree, he was the president of his class and the founder and chief editor of the MMC student newsletter. Dr. Allen has a particular interest in volunteer and community services and participates in the Big Brother program. He loves sporting events, recreational reading, technology, fine arts and spending quality time with his wife, Monica. Dr. Brett Austin has been with PrimeImaging since 1996. Because of his expertise in nuclear medicine, he was appointed the position of Radiation Safety Officer. Dr. Austin earned his undergraduate from Georgia State University and his medical doctorate at the Medical College of Georgia. After his internship at Mary Imogene Bassett Hospital in Cooperstown, he practiced family medicine for three years with the National Health Service. He then completed his residency and fellowship in diagnostic radiology and nuclear medicine at Michael Reese Hospital and Medical Center. Dr. Austin has a passion for the outdoors including fishing and hunting. He lives in Chattanooga with his wife, Karen. They have three children. Following his father’s footsteps, Dr. James Busch developed a passion for the medical field early on. He earned his undergraduate degree from Millsaps College in Jackson, Mississippi and his medical doctorate at UT, Memphis where he was inducted into the honor medical society, Alpha Omega Alpha. He then completed his diagnostic radiology residency and fellowships at the world-renowned Harvard Medical School. Dr Busch’s passion in radiology is providing state of the art patient care with the best technology. One area of Dr Busch’s special training includes radiology informatics where he led the initiative for Diagnostic Radiology Consultants (DRC) to be the first in the world to implement a comprehensive radiology interpretation software suite soon after moving to Chattanooga in 2004. With his love of soccer, he also gravitated towards specialized musculoskeletal training and continues to enjoy providing that skill set to Prime Imaging and the sports medicine community of greater Chattanooga. His fellowship in Vascular and Interventional radiology also continues to drive his desire to help patients with cancer by providing minimally invasive options to provide treatment or diagnosis. Dr Busch was one of the pioneers of thermal ablation used to treat and cure cancers in patients who are not eligible for traditional surgical options. In his free time, Dr. Busch is an avid soccer player who also enjoys boating along the Tennessee River with his wife, Jennifer, and their three children. Dr. Joseph Busch co-founded PrimeImaging, then Diagnostic Radiology Consultants, P.A., in 1992 to carry out his dream of the running a first-rate radiology practice in the Chattanooga and North Georgia areas. Born in Louisiana but raised in Tennessee, Dr. Busch completed his undergraduate at UT, Knoxville and his medical doctorate and residency in diagnostic radiology at UT, Memphis. Dr. Busch served his country as a general medical officer in the USPHS at the Merchant Marine facilities for two years during the Vietnam War. Following this, he served in the Tennessee National Guard M.A.S.H. unit for an additional two years. Dr. Busch has also penned for renowned radiology publications and serves various professional organizations and associations, including as the past president of Chattanooga Regional Oncology Association and as the clinical advisor for A.P.S. Alliance and Sunhealth Alliance Imaging Advisory Committee. Scott Kemmerer, MD, is originally from Richmond, Virginia. He discovered the Chattanooga area while attending Southern Adventist University for his undergraduate degree in biology. He attended medical school at Loma Linda University School of Medicine in California, graduated Alpha Omega Alpha, served as class president during his junior year and received the Comstock Award for the most outstanding medical student by the Department of Internal Medicine during his senior year. After completing his internship in internal medicine and residency in diagnostic radiology at Loma Linda University, Dr. Kemmerer completed fellowships in abdominal imaging at Shands Teaching Hospital at the Univerity of Florida as a clinical professor and then one in vascular and interventional radiology back in Loma Linda University. He then transitioned to an assistant professor and staff radiologist in the Department of Radiology there where he mentored radiology residents primarily in the vascular and interventional, abdominal CT, ultrasound and MRI departments. After realizing he enjoyed practicing radiology more than teaching it, he returned to Chattanooga in 2009 and joined PrimeImaging. Dr. Andrew Kreek is PrimeImaging’s neuroradiology expert. He graduated with a dual degree in biochemistry and business administration from Albright College in Pennsylvania. He then went on to finish his medical doctorate from Temple University School of Medicine and his residency in diagnostic radiology at the Medical University of South Carolina. He specializes in neuroradiology and head and neck imaging during his fellowship at the University of Alabama. He has been part of the PrimeImaging team for over a decade. Dr. Kreek’s professional affiliation include the American College of Radiology and the Radiological Society of North America. He and his wife, Jennifer, have three children. Growing up in a home with two doctors for parents, Dr. Garth McPherson learned first-hand what it means to serve patients and the community. He graduated with honors from Virginia Tech and the Medical College of Virginia where he was awarded membership to the honor medical society, Alpha Omega Alpha. He then studied radiology at the University of Alabama at Birmingham under the world-famous chest radiographer, Dr. Robert Fraser. Dr. McPherson is the medical director of PrimeImaging as well as in charge of PET/CT. He and his wife, Joyce, have nine children. He volunteers in medical ministry in the community and enjoys gardening, ballroom dancing and country music. Dr. James Morrow lived throughout Tennessee before settling down in the Chattanooga area. He completed his undergraduate at David Lipscomb University in Nashville and his medical doctorate at James H. Quillen College of Medicine in Johnson City where he was inducted into the honor medical society, Alpha Omega Alpha. He received specialized training in interventional radiology at Medical College of Wisconsin in Milwaukee. He serves as one of PrimeImaging’s authority in vascular and interventional radiology. Dr. Morrow is blessed with his wife, Tracy, and their two children. In addition to being one of the four founding physicians, Dr. John Nelson is the current president of PrimeImaging. He earned his undergraduate from UT, Knoxville and his Doctor of Medicine and residency at UT, Memphis. There he was invited to join the honor medical society, Alpha Omega Alpha. Dr. Nelson and the women’s imaging staff at the Battlefield location introduced digital mammography to the tri-state area in 2004 and dedicated breast MRI in 2007 after realizing the complex, comprehensive nature of breast cancer screening. Consequently, they were awarded the American College of Radiology's Comprehensive Breast Center Certification in 2008, also a first in the tri-state area. Dr. Lawrence Samuels is one of PrimeImaging’s experts on musculoskeletal radiology and breast imaging. He earned an engineering degree from Duke University before attending medical school at Wake Forest University where he was a member of the honor medical society, Alpha Omega Alpha. He also completed a one year MRI fellowship at Wake Forest. He served as an Assistant Professor of Musculoskeletal Radiology at the University of North Carolina in Chapel Hill before joining the PrimeImaging’s team. Dr. Samuels’ professional affiliations include the American College of Radiology, Radiological Society of North America, Society of Skeletal Radiology and the Society for Imaging Informatics in Medicine (SIIM).